Vaguely military in appearance, Gulfstream 52 is an enclosed center console with stealthy good looks and horsepower to spare. Gulfstream Yachts has received a number of inquiries asking if its 52 is military-made. In fact, it’s designed for civilian adventure. 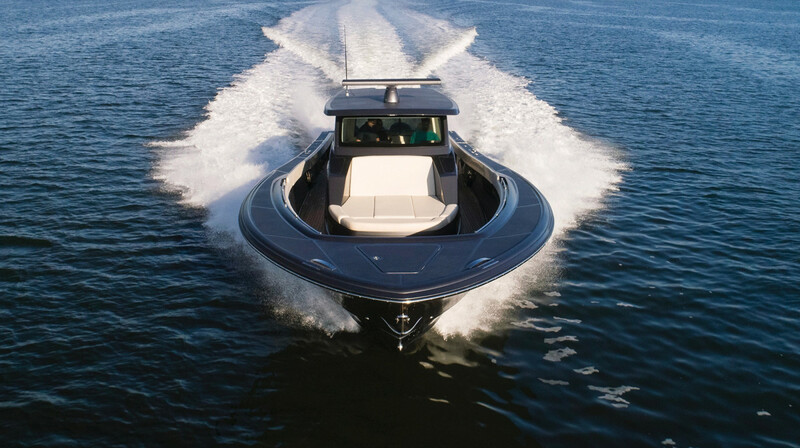 An entrepreneur applies his boatbuilding experience and passion for the water into the new Gulfstream Yachts 52—an enclosed center console with stealthy good looks. 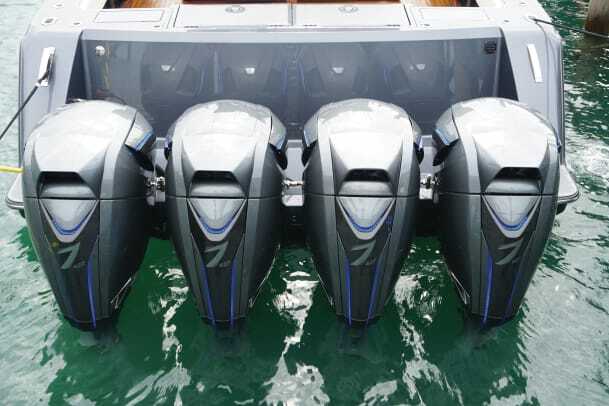 A dark gray boat with four Seven Marine 627 outboards was backed into a corner slip at the Palm Beach Boat Show. I stopped, did a double take and slowly walked around the large hull, looking for a name on the unfamiliar center console with a fully enclosed helm. Then I noticed a number of other people doing the same. 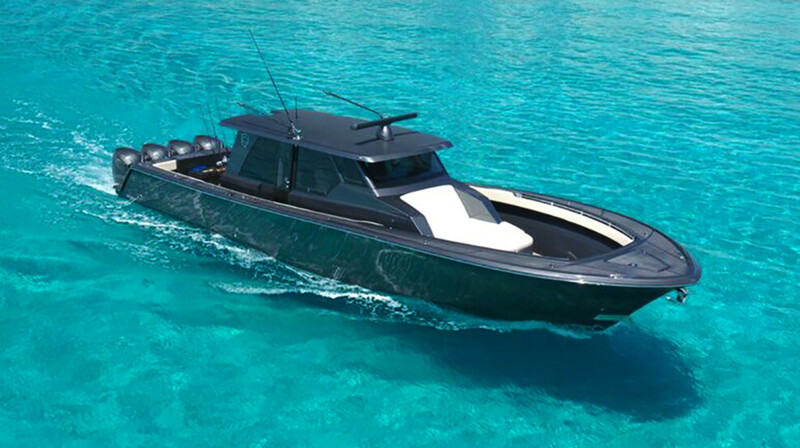 The boat looked like it belonged to the military, but on closer inspection, the metallic paint job and matching performance engines made it seem more luxurious than institutional. That’s when the convivial Hunter James gestured for me to come aboard. James, or Hunt as he’s called, is the owner of Gulfstream Yachts in Tampa, Florida, and he told me this was the prototype hull he built for himself, a boat designed to remedy the flaws he found on other center consoles. An avid fisherman and diver, James related that his wife and guests enjoyed a boat that allowed them to be active by day, but they hated getting wet by passing showers when they were dressed nicely and on their way to dinner in the evening. James wanted a boat that offered room to fish and stay active, but he also wanted protection from the elements at the helm and a comfortable cabin. 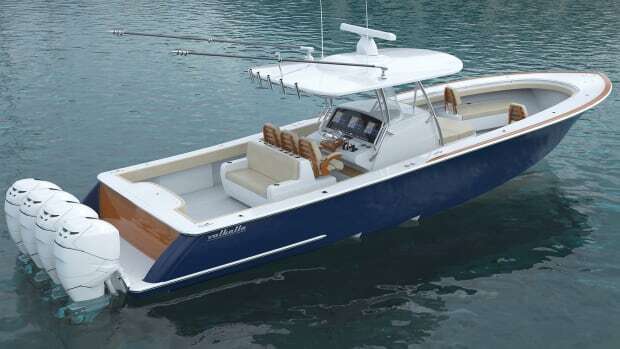 Having built other sportfish boats and center consoles over the past 10 years under the Gulfstream name, James incorporated all the features he wanted into this boat, the Gulfstream Yachts 52, which was causing more than a few jaws to drop at the Palm Beach show. Setzer sees the“S” sheerline as one of the most distinctive parts of the boat; that and the classic Carolina flared bow, which is a nod to his North Carolina roots. Prior to moving to Stuart, Florida, Setzer’s work was focused on elegant and simplistic form and function, but for this project he knew he’d also need a stepped hull for performance. So, he went to colleague and “friendly competitor” Michael Peters. 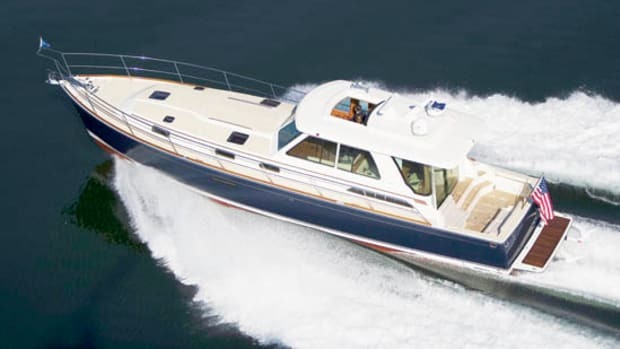 Thus, this 52 boasts the expertise of two award-winning naval architects. “I’m proud of how beautiful it is,” says Setzer. According to James, the company has received a number of inquiries about the Gulfstream from people wondering if it’s a military boat. And recently, Gulfstream Yachts was invited to the Special Operations Forces Industry Conference in Tampa, at which the company gave sea trials to Navy SEAL teams and other military operators. 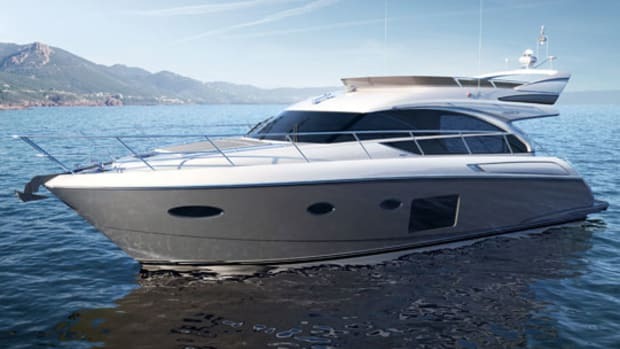 That exposure could open new waters for Gulfstream, but at its core, this 52 is a recreational powerboat for active owners. 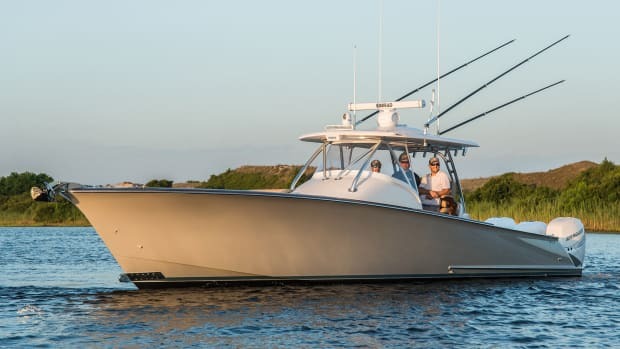 Ideal for fishing, the Gulfstream has a deep-V hull and deep freeboard, along with a wide, nonskid-covered gunwale and bow, where anglers can step up to reel in a catch. The deck is single level from bow to stern. 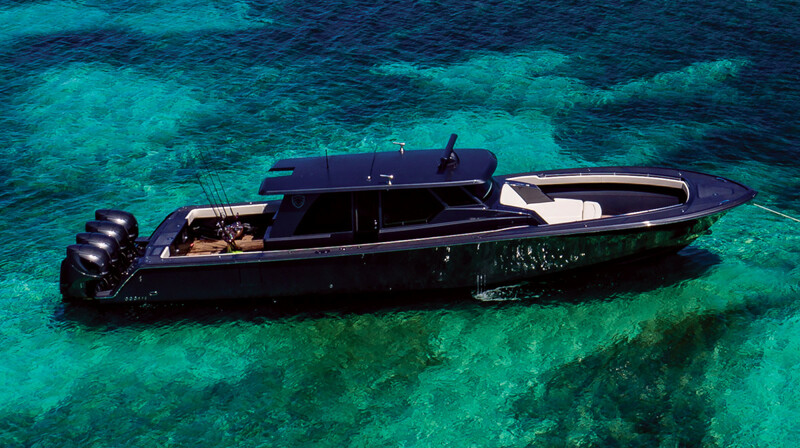 The open bow provides ample room for fishing but also has a three-person sunpad covered with Stamskin One marine upholstery. This Swiss-made, silicone-elastomer-coated jersey material is used throughout for durable stain, UV and heat resistance. 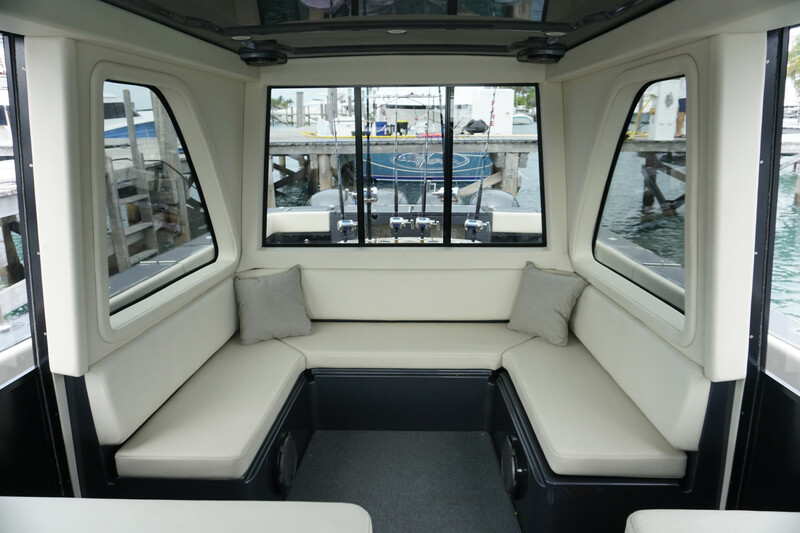 The removable bow seating is one of many options offered with this custom boat; others include the teak decks by Teak Decking Systems and the gray metallic Awlgrip Paint. 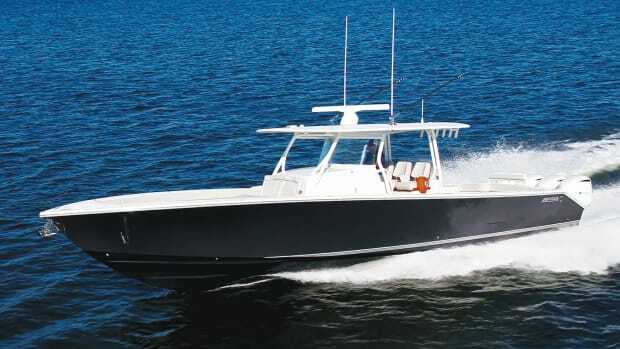 Fishing features on the 52 include two 56-gallon livewells, five insulated fishboxes, four rod holders and a polished Pompanette rocket launcher designed by Murray SportFishing. While the rocket launcher accommodates large rods, it also features a reverse contour for an optional fighting chair or backrest. A built-in magnetic tray holds hooks and tools in place. Electric reels can be powered by outlets hidden under the padded coaming, where there are also JL speakers and lights tucked out of sight and clear of fishing and docking lines. A sturdy dive door to port opens in for easy boarding and the top flips over on robust stainless hinges. Hull No. 1 of the Gulfstream 52 has teak stairs aft of the enclosed helm, in between the pullout freezer/refrigerator, sink and grill. The stairs will access the forthcoming tower to be placed on the fiberglass hardtop. 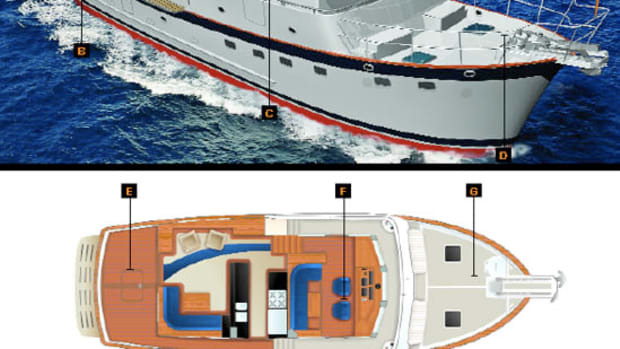 On boats ordered without the tower, the stairs can be replaced by more refrigeration, a bar or a tackle center. Things get interesting inside the cabin. As the sliding door closes, the interior—with its 360-degree views—feels like the deck of a starship. There’s a massive windshield and huge rectangular windows line either side of the salon; there are just enough supports between the windows to provide strength for the substantial roof without sacrificing views. Only the sliding side door and back window open, but a ventilated windshield might be offered in the future. 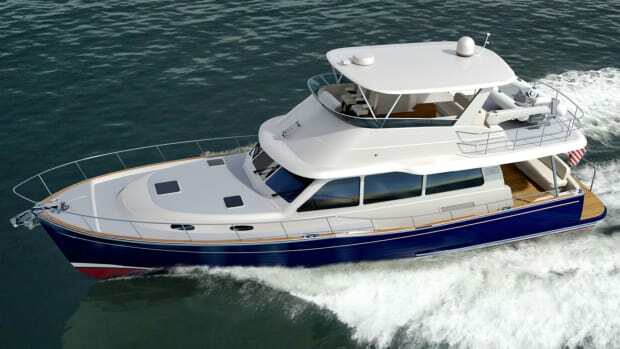 The helm is to starboard and opposite of it, on the port side, is a 17-inch Garmin unit that matches the model used by the driver; it’s installed for a navigator, who can sit on an upholstered cube that houses the battery and charger. This is an interesting use of space and a nice addition for a guest who wants to assist the captain, watch the weather or monitor the engines. Steps descend from the salon to a no-frills accommodations level with a king berth (or optional twins), plus storage and access to the water tanks. A table that converts to a berth can be added in this space, too. According to James, extra cushions can be added to the salon to create a queen berth, which is a nice option to have. But for the most part, the overnight acccommodations are straightforward. 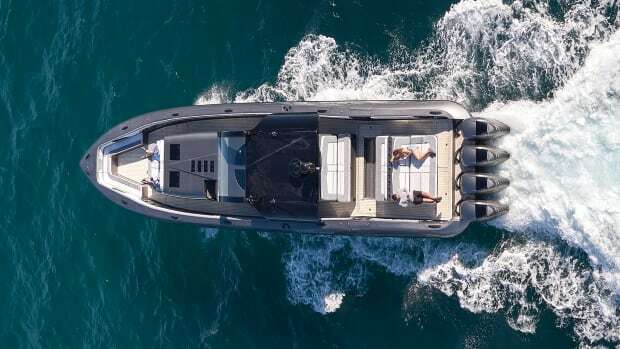 On this boat, the finishes and attention to detail are the luxuries, although the 52 also is offered with creature comforts like three air-conditioning units, a Kohler generator and Seakeeper 6. On the day I sea-trialed the Gulfstream 52 the winds, current and tide were all moving in different directions at a quick clip. The bowthruster came in handy to maneuver the 52 out of a tight slip and onto the Intracoastal Waterway. We were on plane at 16 knots with almost no bow rise, but as we hit open water, the quartering seas churned up and the winds rose, a recipe for a rough ride. We turned on the Seakeeper and while it took some time to spool up, we evaluated the ride at various speeds, carved wide and tight turns, and observed the hull as it was lifted over the following seas and climbed back over waves into the chop. The pounding was much less than I expected it would be, thanks to the stepped hull, and the bow stayed dry. Balancing the four engines took a bit of throttle juggling, but the levers operated smoothly and felt comfortable. When the Seakeeper finally kicked in, the roll of the boat came to a noticeable halt, but then waves splashed over the front deck as the 52 steadied. Fortunately, we were happy and dry in the enclosed cockpit. 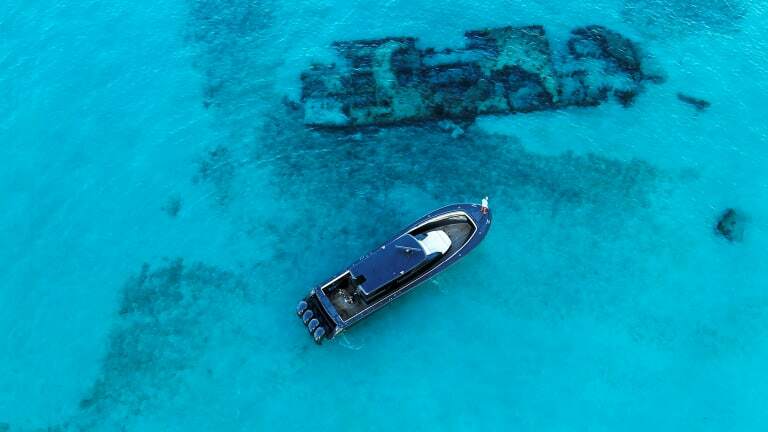 After that, the boat maintained an even keel without chine walking, despite the challenging conditions. 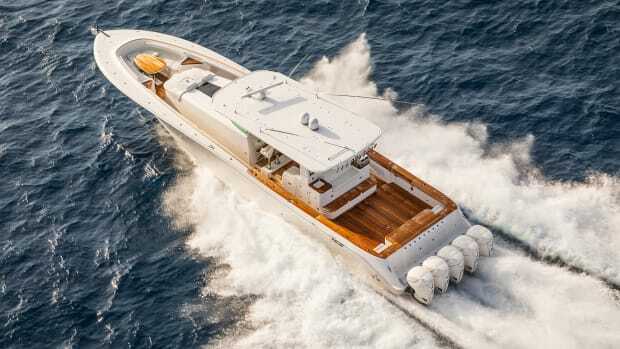 Cutting our way back to the dock through 4- to 6-foot waves, the engine power was palatable and the ride was relatively smooth and quieter than anticipated, given the roar of over 2,500 horses sealed out by the glass. As we approached the dock, I was glad I was not at the wheel. I watched the captain go from running the bowthruster and steering wheel to feathering the throttles. This was a lot of boat to tuck into a tight slip while fighting the whims of the waterway, but the 52 was coaxed gently in and we tied her securely. 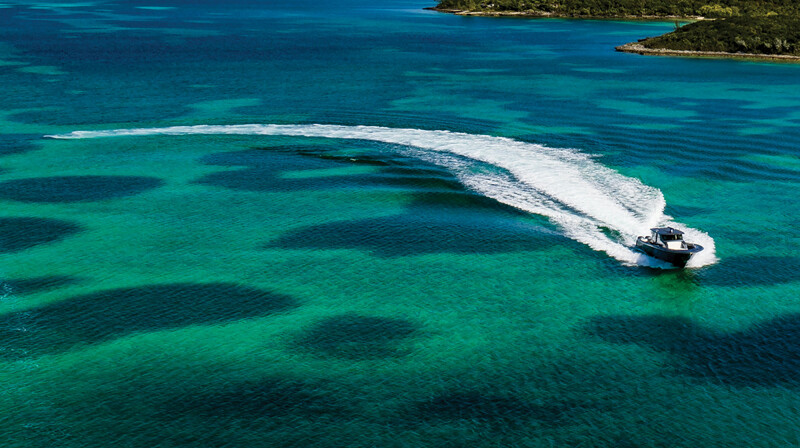 The crew returned to provisioning the boat for departure the following day; it was heading out to fish the Baker’s Bay Invitational tournament in the Bahamas. Walking back down the dock I glanced over my shoulder once more for a last look at the Gulfstream. Even though I missed the Florida coastal wind in my face while running the boat from the enclosed console, I certainly would appreciate this type of protection in a squall or while crossing the Gulf Stream. In the end, it was a good day in rough water, and that’s what boating under cover is all about.